Following the apparent failure of reaction wheel 4 on May 11, 2013, engineers were successful at transitioning the spacecraft from a Thruster-Controlled Safe Mode to Point Rest State at approximately 3:30 p.m. PDT on Wednesday, May 15, 2013. The spacecraft has remained safe and stable in this attitude and is no longer considered to be in a critical situation. As part of a normal spacecraft response to a pointing error, redundant electronics were automatically powered off to isolate them as a possible cause. However, once the team recovered the spacecraft to Point Rest State (PRS) and exonerated those systems, they were turned back on, providing full redundancy to the spacecraft. The reaction wheels remain offline. The photometer, which was turned off to reduce the power load, will be turned back on in the near future to keep thermal conditions of the spacecraft within nominal operating parameters. 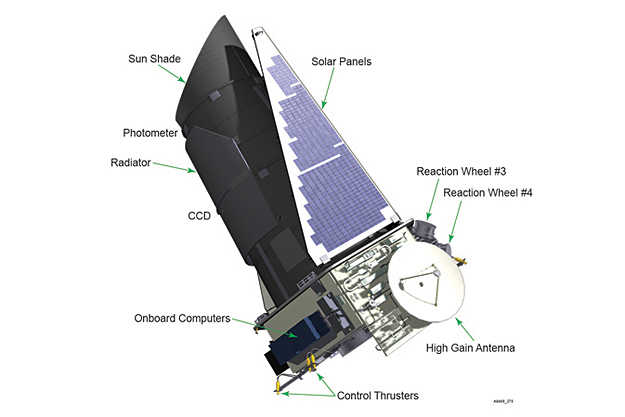 Kepler is not in science data collection. PRS was developed in order to preserve fuel for an eventual recovery effort once a second wheel failed. This state uses thrusters to control the pointing of the spacecraft, tipping it towards the sun and letting the solar pressure tip it back away, resembling the motion of a pendulum. This is a very fuel-efficient mode, and it also provides an on-demand telemetry link to allow engineers to monitor and command the spacecraft. With nearly a week of PRS operations, the fuel usage appears to be on the low end of our estimates, allowing time for recovery planning. The operations staff at Ball Aerospace did a wonderful job at developing and implementing PRS. As a result, the spacecraft is not in an emergency condition, and work can be conducted at a more deliberate pace. For the next week or so, we will contact the spacecraft on a daily basis to ensure PRS continues to operate as expected. Over the coming weeks, an anomaly response team (ART) will evaluate wheel recovery options. The ART includes members from NASA Ames, Ball Aerospace, the Jet Propulsion Laboratory and UTC, the wheel manufacturer. This team has access to a broader reach of experts throughout NASA and industry, and will manage the wheel recovery efforts. The team will continue to analyze recent telemetry received from the spacecraft. This analysis, and any planned recovery actions, will take time, and will likely be on the order of weeks, possibly months. Any planned commanding will first be vetted on the spacecraft test bed to validate command operability. For now, PRS is working very well and keeping Kepler safe. We will provide updates on significant changes as the plan develops. We are grateful to all our followers for their well wishes and support!